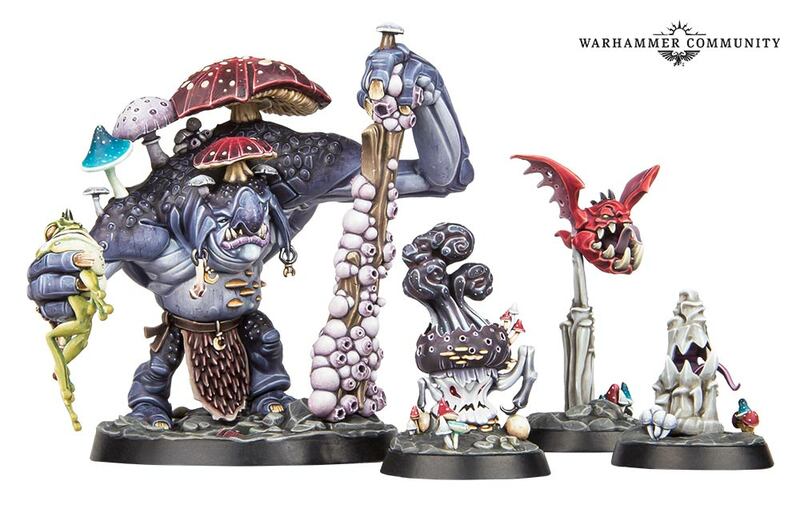 The Gloomspite Gitz have been fully previewed for Age of Sigmar, and it’s a glorious time to be alive! 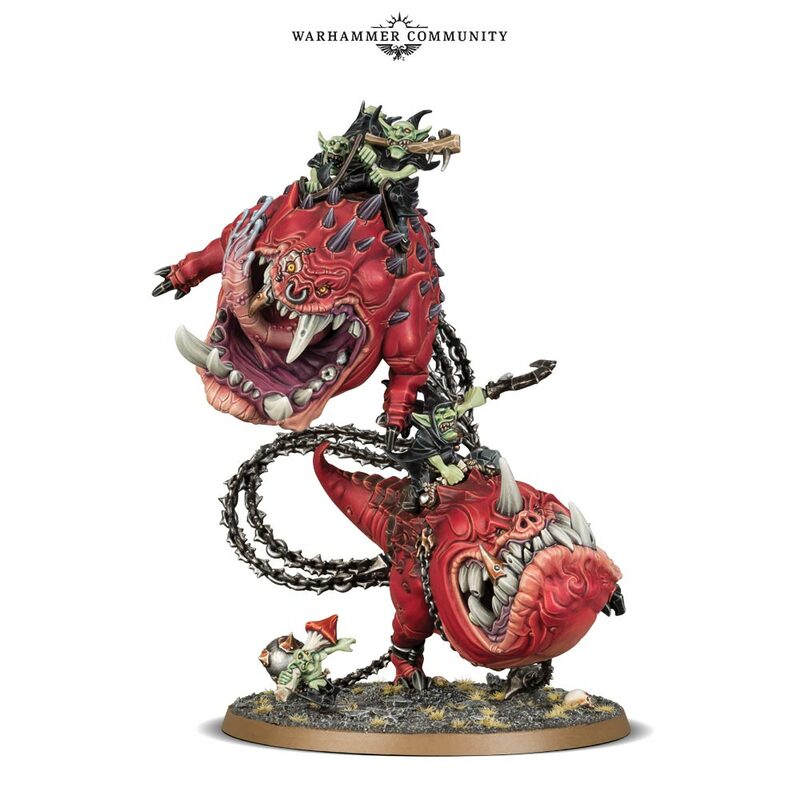 I really don’t know what I would do with a full army of these gits, as I’ve already got Age of Sigmar armies coming out of my ears, but my goodness is this difficult to resist! I was first attracted to the grots army with the last warband for Nightvault, and while I’ve got them built up and primed, I still need to get moving with actually painting these chaps up! Of course, it’s only natural with projects like these that I’ve been considering the idea of a wider army, especially as GW provide rules for using the warband alongside a full force, but I’d managed to resist – preferring to focus on the Nighthaunt. That is, until now! I love the new terrain piece in particular, as it reminds me of the sort of Lego sets I used to love as a child. I suppose a lot of my love of the Warhammer hobby is somehow traced back to my childhood love of building stuff with Lego, but this kit in particular has really captured my imagination there! 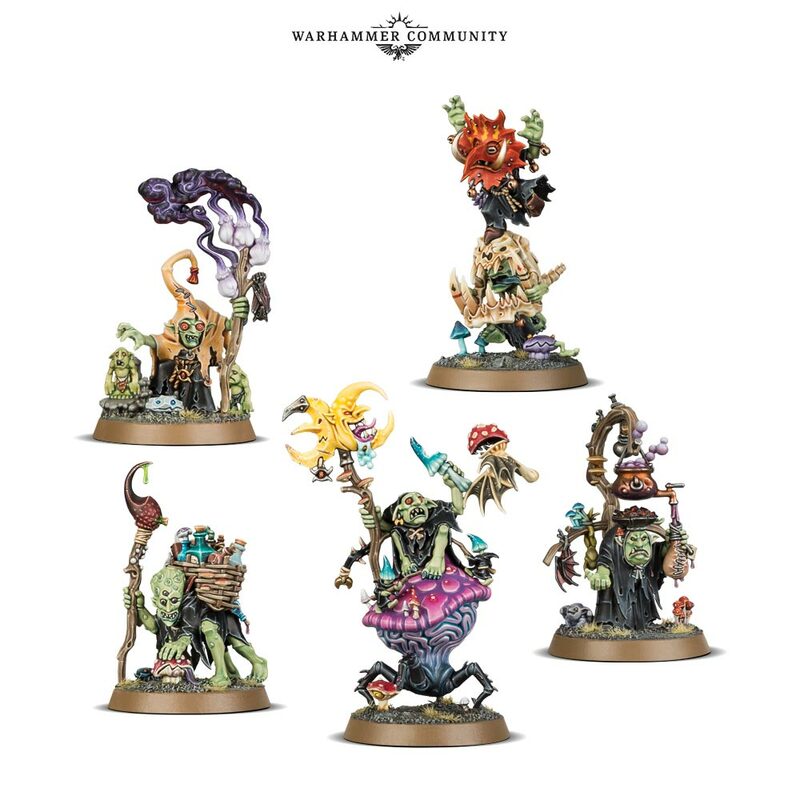 Speaking of the Underworlds warband, the new Troggoth models coming are utterly amazing, and I think it’s these models that I want more than the actual grots themselves when it comes to this release – primarily because of the fact I’ve been enraptured by the upcoming Mollog’s Mob band that I’m hoping will be coming out shortly! 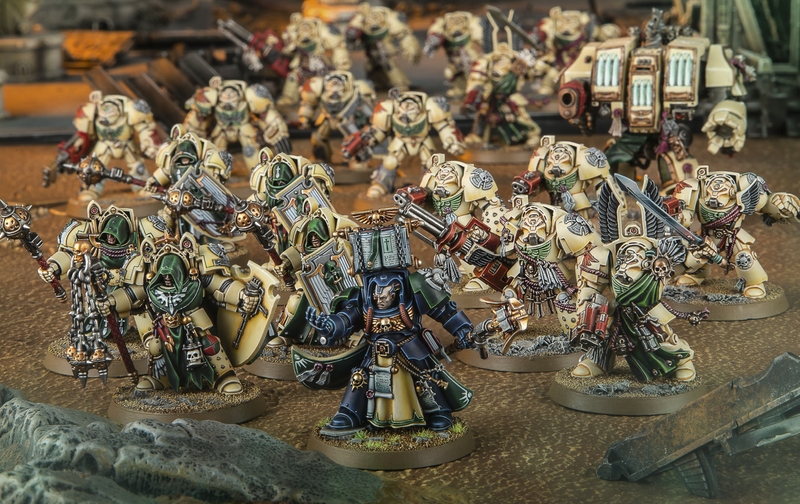 There are a whole load of interesting bits on these models, and while I invariably find 40k miniatures such as the Death Guard to be really too busy, the same is rarely true for these new fantasy offerings, and instead I just marvel at the wealth of detail captured on each one! 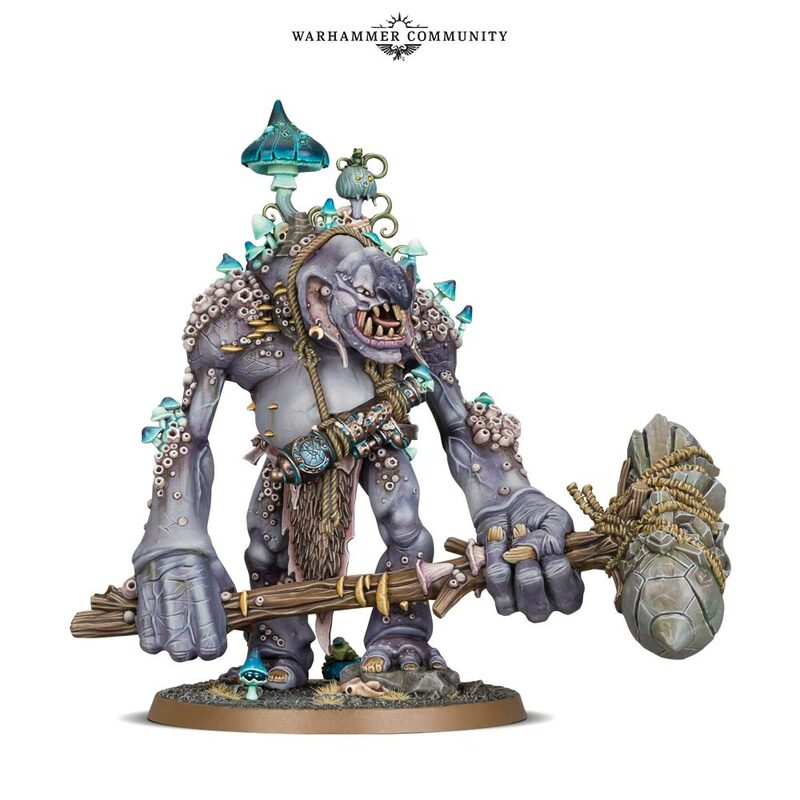 The massive Dankhold Troggoth is definitely an exciting option, though I’m really very taken with the new, plastic Mangler Squig, and I’m feeling the need to pick this kit up perhaps sooner than I’d have liked!! Well, I mean, look at it! 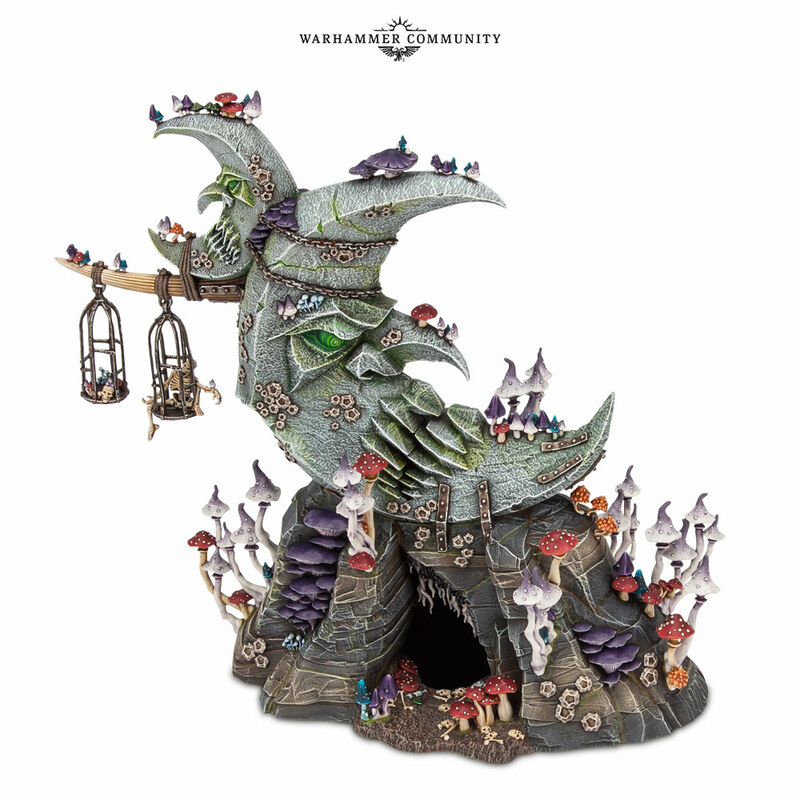 I’m definitely going to need to re-evaluate my options for Warhammer armies in 2019, but I think it would be remiss of me not to go for at least some of the insanity that is the Gloomspite Gitz! 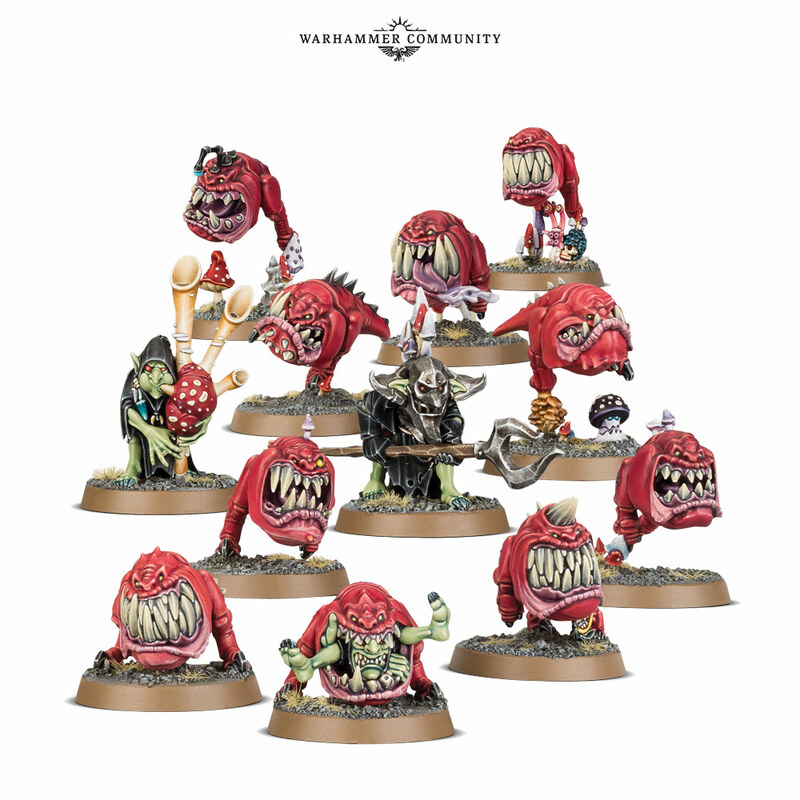 Author spalanzPosted on December 31, 2018 December 30, 2018 Categories WarhammerTags Age of Sigmar, Games Workshop, Gloomspite Gitz, Grots, Moonclan Grots, Squigs, Troggoths, WarhammerLeave a comment on Grot invasion! It’s been another quiet week this week, which is perhaps to be expected with Christmas and all. I’ve been trying to make some time for painting during the latter half of the week, with the intention being that I’d have something to show you all for this blog here on Sunday – which I suppose is the point of me doing these blogs in the first place, so well done me! I’m still very busy with army lists, and having pretty much finalised my first plans for the Grey Knights, I’ve started work on the Purifier squad with gusto! I’m really enjoying these chaps for the moment, so I hope that continues. Unlike a lot of projects (Tau instantly spring to mind here), I’ve got quite a clear idea of what I want to achieve with the paint scheme, so I’m hoping that means it’ll go quicker for me! I’ve done the silver quite quickly – just a Leadbelcher base, with a bit of a focused shade of Nuln oil, then a soft drybrush of Ironbreaker. I’ve not yet gone in with the blue glaze, as I’m building myself up to that one! Having base coated the helmets with Celestra Grey, I’ve today gone in with a diluted shade of Coelia Greenshade – 1 part shade to about 4 parts Lahmian Medium. It’s left them with enough detail, but there’s a definite greenish hue to them that I quite like. The tabard on the Justicar has been painted Zandri Dust and shaded with Seraphim Sepia, and the gold details are just base coated Retributor Armour. Finally, the Force weapons have been base coated with Caledor Sky. I’m hoping to be much further progressed as this week moves on, so hopefully I’ll have more progress for you all then! I had the Grey Knights Paladin Squad for Christmas, and so have built myself a Grand Master using the parts from that kit to really flesh him out as a fancy chap. I’ve also been building models for both the Deathwatch, and the Ravenwing projects that I have going on at the moment – I’ll get to the latter in due course here on the blog, but for now, let’s talk about the xenos hunters! I’ve been slowly building up a Deathwatch army since Death Masque arrived back in 2016, but have left it quite a while between the last phase of my painting and this current spurt. The reason being that I’ve been talking to a fellow gaming buddy about entering a doubles tournament in 2019, in the assumption that Warhammer World will be holding the event again! Now, I’ve played in card game tournaments in the past, but I’ve never even attempted to go along for a miniatures tournament, as I get the impression that it’s just far too competitive for my liking. Well, Kev has not given me any reason to think I was wrong in this assumption, so far! He’s going Grey Knights (it was against his kill team that I first encountered that game, and he’s been building up the army since) so I’m going with another branch of the Inquisition, and hopefully we’ll either face Chaos or Xenos to make our army choices worthwhile!! Initially, it’s quite a cheap battalion list, with a fourth group of veterans that includes a Terminator taking up a significant number of the points. I’m fully intending to use this as a distraction unit though, hoping that it will draw enough fire that the other units will survive reasonably unmolested. The Venerable Dreadnought needs a new arm, which I thankfully have thanks to the bits box, and I’ve got a Razorback for the more melee-orientated unit of Veterans to get them closer to where they need to be. I did initially want a Chaplain in there with them, but I’ve instead gone for the JumpMaster as he has a slightly better stat line. Though I am wondering if the Terminator will be worth it, so might make some adjustments over time! 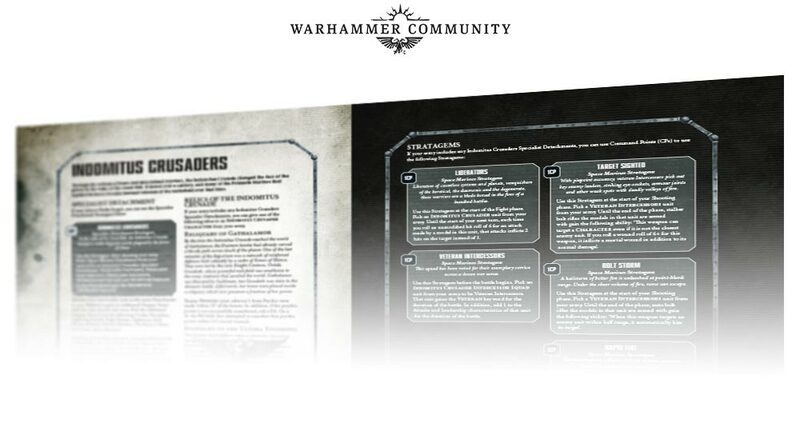 The first thing that strikes me about Deathwatch is just how many crazy options there are in the Codex, and how many interesting squad permutations you can get. I’m a bit confused by the whole mission tactics / special issue ammunition thing, and with the stratagems on top, I feel like this army is something that can be quite unwieldy quite quickly, so I definitely want to get some games in with it as soon as possible, as I need to get used to that side of things before I get into any kind of tournament setting, I think!! To that end, I’m thinking I might need to make an alternative list, just to get to grips with the army in general, and then see how it goes adding in the relevant units. I do already have a sizable Deathwatch army, so I’m hoping to get to the shop in the new year and see how it goes! Stay tuned for those exciting updates, anyway! It’s been a lot of fun resurrecting the old hobby progress blogs for December, and I almost feel a bit sad to finish the series! I do think they’re a great way to check in and keep me on track with my goals, so I think I’ll definitely be doing a monthly iteration throughout 2019. I have a lot of goals for next year, so we shall see how those pan out! Come back on Tuesday, 1 January, to find out more about those goals!! Author spalanzPosted on December 30, 2018 Categories painting, WarhammerTags Deathwatch, Grey Knights, hobby progress, painting miniatures, Space Marines1 Comment on Hobby Progress, week four! 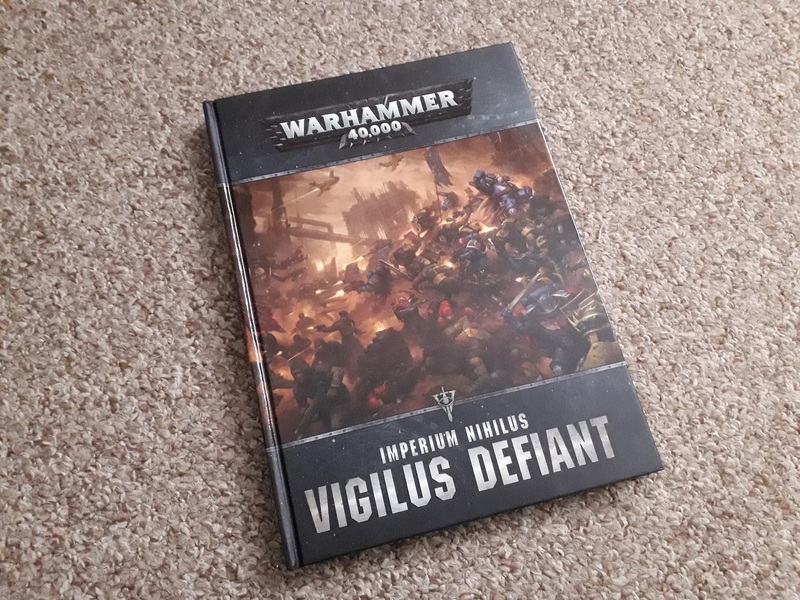 Having already taken a look at the opening stages of the Vigilus campaign in last week’s blog, I thought I’d come back to you all today with some of my garbled thoughts on the first campaign book in what promises to be an exceptional series: Vigilus Defiant. This is book one in a two-part series, Vigilus Defiant feels a whole lot like the classic sort of RPG sourcebook to use in a campaign, rather than some of the campaign books of yore. First of all, let’s have a look at how the book breaks down: 115 pages of background and fluff for the Vigilus campaign, bringing things up to date from the two battle-box releases to the point where the Space Marine coalition is poised to go up against the Black Legion, Genestealer Cults and Ork Speedwaaagh; 50 pages of narrative play rules, featuring twelve new missions to play and the rules for linking them to form a campaign (six Crucible of War and six Echoes of War missions) and rules for battlegrounds, including specific battlezones that replicate locations on the planet; and finally, 35 pages of new rules, including the rules for the new models released alongside the new book, as well as 22 “specialist detachments”, which is where I want to go first. These specialist detachments have been likened to the various detachments we had during 7th edition, such as the infamous Necron Decurion detachment. In case you’re unfamiliar, 7th edition Codexes featured a number of detachments alongside the datasheets, which kinda functioned as suggested armies. There were usually a couple of smaller scale detachments, then there would also be one army-scale one that was quite often made up of the entire range (or as much of it as was sensible, in the case of armies like Space Marines). You gained wonderful bonuses to your army if you included every single unit specified – but that detachment literally was your army. For example, a fully kitted-out Dark Eldar list that followed the Kabalite Raiding Party detachment cost 2055 points, giving you no room to manoeuvre if you wanted to include anything else. Furthermore, it would force you to take units you might not want to take, but the worst part of such detachments was that you invariably saw the same army being played by all. Especially, the Necron Decurion! Specialist Detachments are nothing like this. You start off with your army as you’ve been building it for a game regardless. You then look at how that army has been structured, in terms of the variety of detachments you may have included in it (battalions, outriders, etc). You can then pick one of those detachments to become the Specialist Detachment, paying 1 command point for the privilege. This action actually does nothing by itself, it just adds a further keyword to each datasheet for the models in that detachment. 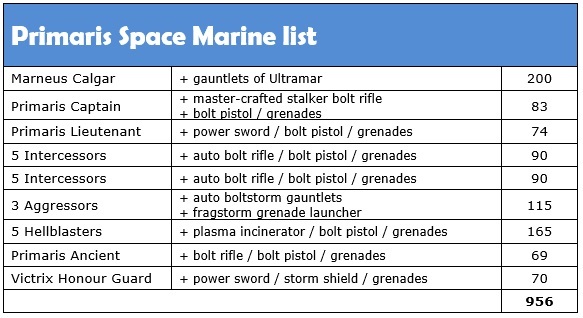 I’ve been working on a Space Marines list for the past few days, so I think it might be easiest if I use that to show you what I mean! This is one Patrol detachment, and one Vanguard detachment. So I get 4 command points, which isn’t particularly fabulous, but I’m working within the limits of what I have. I can use one of those command points to give all of the units within one detachment the Indomitus Crusaders keyword, which is fine, but doesn’t do anything else. However, I’ve unlocked a new warlord trait for the army, Grey Shield, which can give a unit from the same detachment as my warlord an additional Chapter Tactic until the start of my next turn. That feels a bit wrong to me, so I don’t want to go along with that one. But I also gain access to two new Relics: Reliquary of Gathalamor (which affects enemy Psykers within range of the bearer) and Standard of the Ultima Founding, which I can use on the Primaris Ancient to give a once-per-battle effect of allowing infantry within 6″ to re-roll hit and wound rolls of 1. That’s a useful one, as my plan for the army is a sort of gunline thing that makes use of as many aura abilities as I can generate. The Ancient’s new ability is in effect until the bearer next makes a move, so I assume it will stay in effect so long as I don’t move him. There are, additionally, five unique stratagems that I can use on these chaps now that they have the Indomitus Crusaders keyword. Three of them are dependent on a fourth having been used – for 1 command point, I can upgrade one Intercessor squad from the detachment to be Veteran Intercessors. If I don’t use this one at all in the battle, then I actually only get one unique stratagem. Hopefully, then, you’re seeing the point that these Specialist Detachments are not likely to be particularly game-breaking for the time being. They are really quite command point heavy, and most armies that are built to maximise command points are, I imagine, built with a number of stratagems already in mind. If you’re now faced with yet more choice for your points, are you likely to forego spending on those pre-determined stratagems to sink a few of them into one of these detachments? You’re pretty much committing to at least 2-3 command points for this – you have to pay 1 to unlock the keyword, which you would only do if you wanted to use at least one other stratagem that the detachment would give you access to. I feel like these things are primarily going to be used by players who like a more fluffy or wide-ranging kind of game. 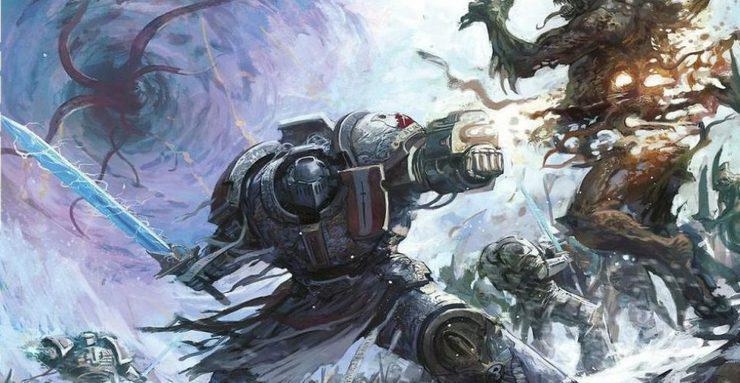 The more competitive players will most likely stick to their codex, with perhaps one or two who are keen to exploit the warlord traits or relics that also come with the detachment. Importantly, you also have the option (for another command point) to give a non-warlord the warlord trait from the detachment, once you’ve made the initial investment. Interesting. At any rate, the much more exciting part of this new book, for me, is the wealth of narrative content it contains. I’ve already rhapsodised quite a lot about similar content we have just seen in Chapter Approved, and to get more of it so soon is quite magnificent, I have to say! It’s enough to keep games really fresh for a long time to come, I’m sure. I’m deeply impressed with the lore contained within these pages – not only do we get the whole story of Vigilus and the factions thereon, but we get a really in-depth look, which is what gives it the feel of an RPG sourcebook. There are pages of details on each of the hive-sprawls across the world, as well as rules for you to create games that take place in each one. It’s an incredibly detailed book, the like of which I don’t think we’ve seen before for 40k (or at least, not for a long time). While I’m hesitant to say I want more of this, as I don’t want any future campaign books to feel like they’re carbon copies of this, I do like what they’ve done here, so I would like to see a similar approach in the future!! We’re due to get a second book at some point, as stated in the introduction to this volume, and my guess would be that it will come around March to tie-in with the whole 80-day countdown we’re on for Vigilus to fall to Chaos. The new Black Legion character Haarken Worldclaimer has already planted his spear in the world, and decreed that Vigilus will be in the hands of the Warmaster within 80 days and nights. If that isn’t a huge telegraphing of the fact Abaddon is going to feature very soon, then I don’t know what is! 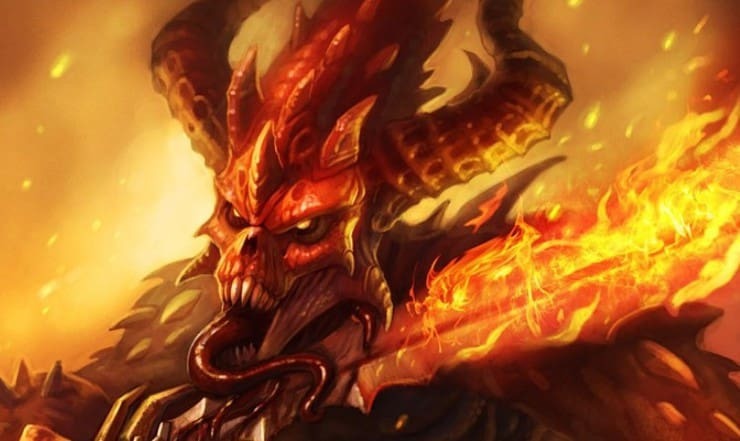 Of course, it’s unclear as to whether we’ll be getting a new model for the Warmaster: he definitely needs it, for sure, and I think it would be a nice parallel with Calgar here for us to have Abaddon come out alongside book two, perhaps with a new Space Marines model, either a new hero or a re-imagined hero of yore. 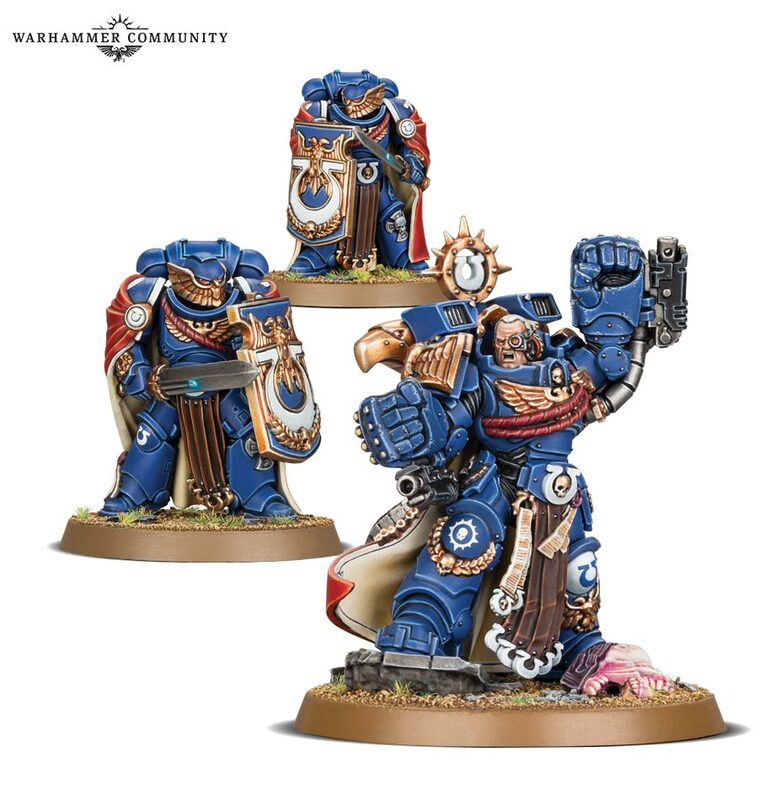 Haarken Worldclaimer is a very nice model, for sure, but I don’t think we can have a situation where we’ve got the Chapter Master of the Ultramarines leading the forces of “good”, but just the Herald of the Apocalypse on the opposing side of the field. I believe March will be seeing the release of those Chaos models from Blackstone Fortress as a separate range, but I’d also hate it if the new Chaos bad guy were to be Obsidius Mallex. We need Abaddon, for the Emperor’s Sake! I think the only thing that’s putting me off thinking we’re guaranteed the new model next is that he really should have showed up during the Fall of Cadia storyline, but we didn’t get anything. If we’re having a new Black Legion release in March, then I think the time would be even more perfect to bring out a re-imagined Abaddon. It’s got to happen! But that’s all just for Vigilus #2. What about the future of the 40k line once we’ve got the final codex out there? I keep reading that Genestealer Cults will be coming at the end of January, at which point we’ll have seen all of the existing 7th edition Codexes be updated for 8th edition. 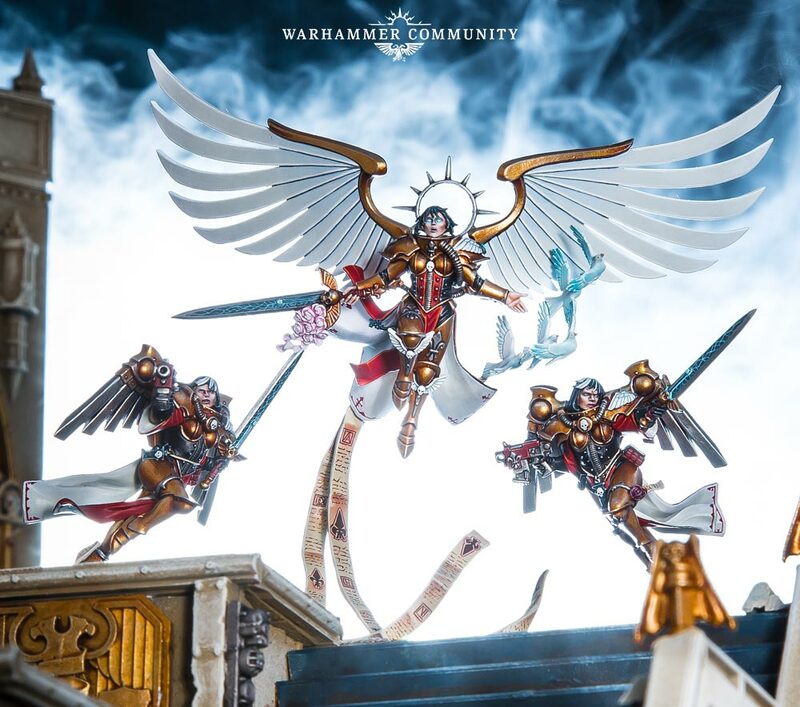 There are still model lines such as the Inquisition that don’t have a book, though they are in a peculiar place and I don’t think they’ll have anything specifically for them without a new model release. 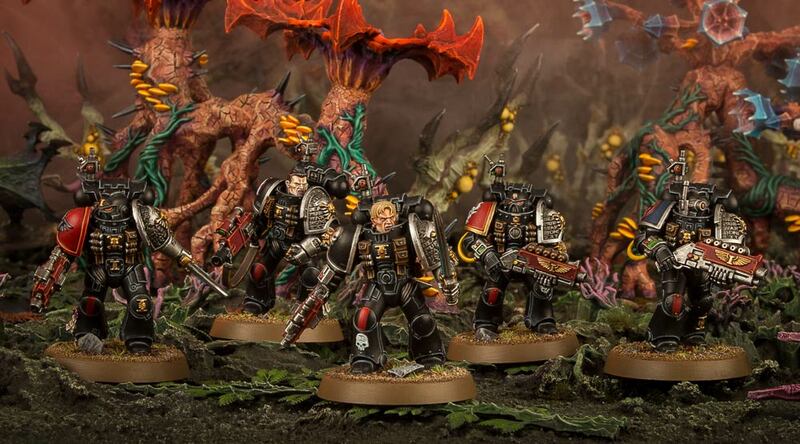 I feel reasonably sure that we’ll get an Inquisitor expansion for Kill Team, after which we can presumably see the models released for regular 40k with a new book. But that could be months if not years away. GW have already stated that there are only rules for armies in this book if it makes sense for the army to be there. 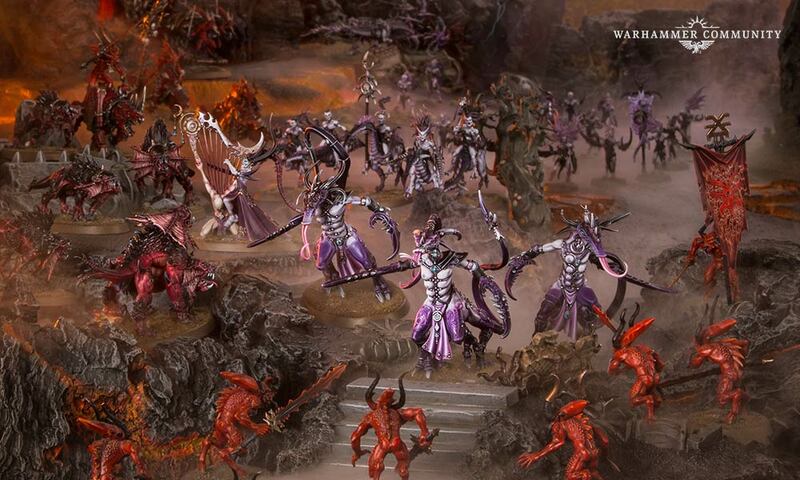 So we have no Necrons, no Tau, and no Tyranids, and also no Chaos Daemons or Dark Eldar (even though the latter are mentioned as being on-world, conducting raids). While there are Space Marines present, there are no Blood Angels, Grey Knights or Deathwatch rules. However, future campaigns that do feature these armies will feature rules specific for them, so I think that’s a very sensible way to go about things. It also confirms future campaigns are in the works, of course! I really enjoyed reading through the campaign books of 7th edition such as Shield of Baal and the Tau stuff. Important to note, of course, the War on Fenris campaign gave us the rules for Magnus and the new Thousand Sons range in the last months of 7th edition, so it isn’t entirely unprecedented for a new army to get their rules in this manner – maybe that’s how we’ll get the smaller stuff like Inquisition rules. At any rate, I think the future of the game being in Campaign books could well be magnificent, and I am really looking forward to seeing what 2019 has in store for Warhammer 40k! Well, having spent most of the month of December looking through the Codex, and thinking of a couple of list ideas, I think I’m more or less settled on how I want to build up my Grey Knights for the first 1500 points. 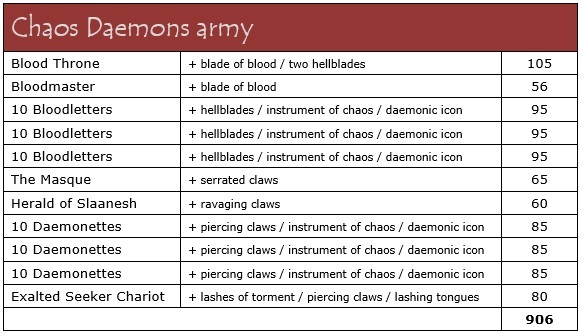 I must say, the new Chapter Approved has helped incredibly with this list, as I had originally written it up with the points from the Codex, and realised I’d have to get rid of something in order to fit in enough HQs to make the detachments I wanted. Now, however, I can not only build a battalion and a vanguard detachment, but I’m halfway to a spearhead detachment, as well! The idea of the list is to have some massed firepower to help get most of the units into melee range. Pretty much everybody has some form of ranged weaponry, of course, but it feels like the Grey Knights want to be in close combat (albeit their attacks and weapons skill might not make you think that at first glance!) Everybody is a psyker, too – even the dreadnought – which is a whole new world for me as regards 40k. Playing Dark Eldar, Necrons and most recently, Tau, has not prepared me well for just what is involved in the psychic phase! There are a couple of lynchpins for the army, though, and I think I’ll go over these first. The Grand Master has the Rites of Battle ability, granting re-rolls of hit rolls of 1 for units within 6″ of him. The Paladin Ancient’s banner will not only add 1 to the Leadership of units within 6″, but he will also give each model from those units an extra attack when they fight in the combat phase. So he’s quite useful to have, though he does need to be shielded from being targeted himself, so I see him being behind the Paladins and at least one of the Strike Squads in the combat phase. In terms of Psychic ability, every unit is a Psyker as mentioned, with a total output of thirteen psychic powers per turn (and thirteen deny tests). Grey Knights take their power from the Sanctic discipline, which are a good mix of directly offensive, combat buffs and protection for the army. Everybody also knows Smite, although it works a little differently for Grey Knights, thanks to the Rites of Banishment ability. It has a shorter range, and only deals out one mortal wound if successful, except when targeting a Daemon unit, in which case it deals a flat 3 mortal wounds. 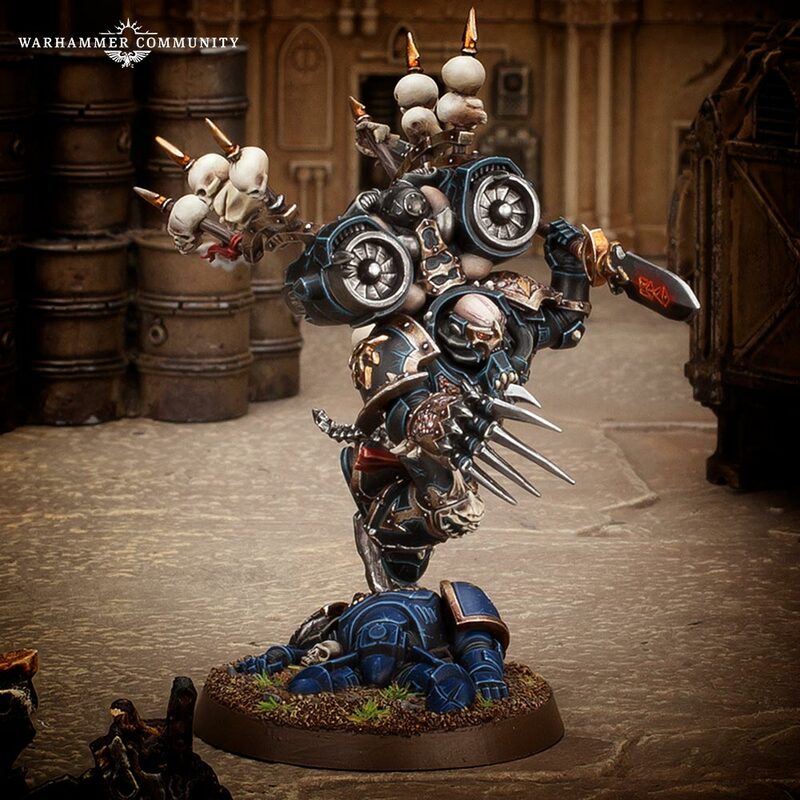 At first glance, it feels a bit like Grey Knights are hard done by with this, but then you have to remember that it is a question of balance. Whereas most armies will have maybe a couple of Psykers, every single one of my models in this army is a Psyker, so you can’t have them all dishing out normal Smite and think the game could still be balanced! As it stands, I’m pretty happy with the army list that I’ve come up with. It’s also going to be fairly straightforward to put together. I’ve already got two Strike Squad boxes, a Paladins box and the Brother-Captain model, so I’m almost halfway there already! I’ve ordered some bits online with which to make the Brotherhood Champion, and the Paladins box will make both the Squad themselves and the Ancient and Grand Master – there’s a fantastically-posed Paladin Paragon in the Codex that looks so wonderfully ornate and fancy that I think he’ll make a great figurehead for the army! That only leaves a third Strike Squad box and a Venerable Dreadnought to get, so it should be an easy enough task! The models are so beautiful though, I can see me taking about six months or longer to actually get anywhere with them! Especially that banner on the Ancient – it looks awesome, I really hope I can get somewhere close to that! However, I’m already thinking about how I can build this up to 2000 points, at which point I think I might be finished with the force. While I am a bit hesitant about the infamous baby-carrier, I think it might be nice to get the Nemesis Dreadknight in there, simply because it’s still such an iconic model for the army despite the fact it looks kinda silly. 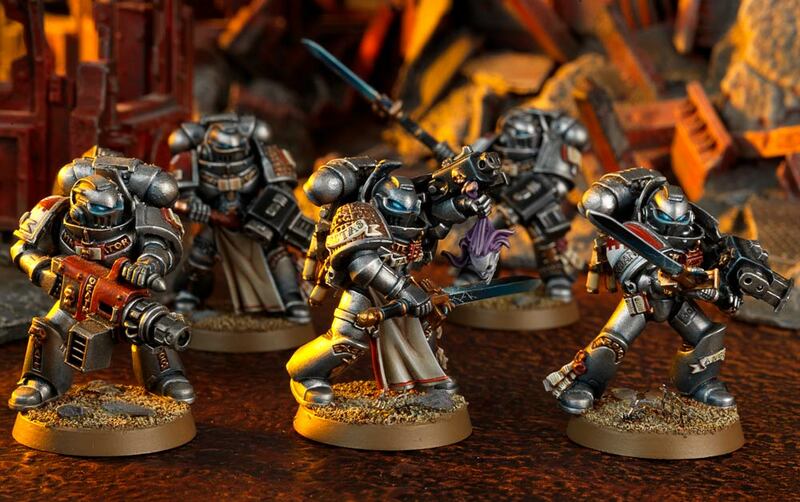 I’d also like either more Paladins or else regular Terminators, as I think they also look fancy as all hell, and it would be great to get some more in there. Transports are an issue for me, as I think the amount of close combat stuff I have going on in here means I do kinda need them, but I don’t really know how! I was initially thinking Land Raiders, but they’re so expensive I’m veering more towards Razorbacks for now. But that’s a problem for another day. I definitely want to have another Strike Squad, mainly because of the fact I’d like to have one of every unit, so think I’d like to get some Interceptors, and then maybe just five more regular Strike Squad guys, who can be used if I ever want to swap-out the heavy weapons for a cheaper squad. I’m really excited to get moving with my Grey Knights, as I think it’s a unified army that looks pretty awesome when you see them en masse. The heraldry, and the whole lore of the daemon-hunters with their words of power and warding implements really appeals to me somehow. 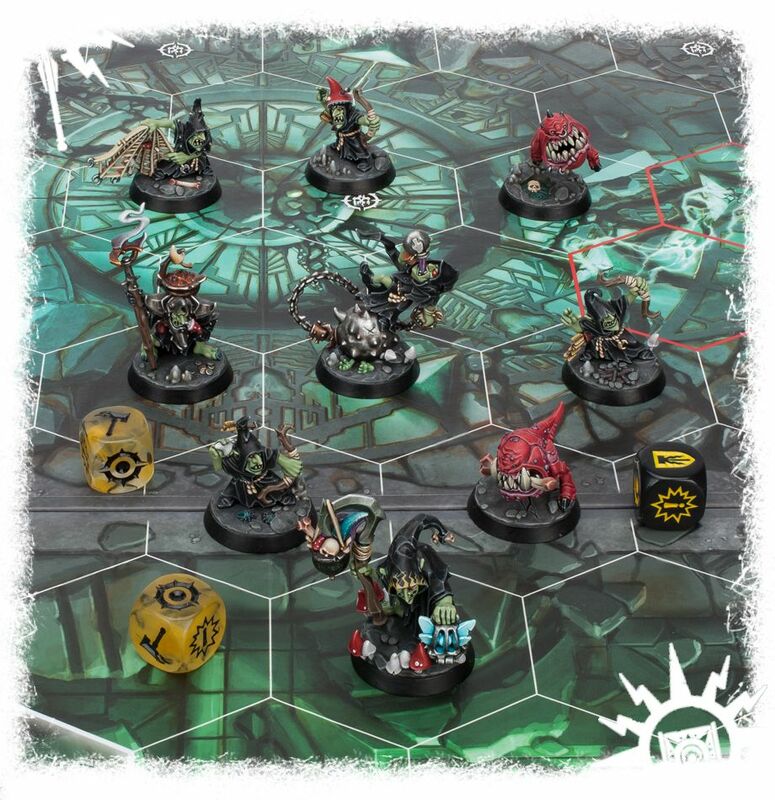 I’d imagine that playing these guys on the tabletop would be nicely thematic, although I have heard that going up against daemons isn’t exactly a picnic for them. Even so, I’m quite excited all the same! Part of me has been thinking about doing a Kill Team for these guys while I’m building up the full force, though I’d also like to just get moving with the things that I actually want to paint, which may not have a place in KT. For the time being, though, I’ve still got the five Purifiers on the go, and I’m joining in with Azazel’s January Painting Challenge with the Grand Master himself! So stay tuned for updates there!! Chapter Approved 2018 is here! The now-annual update to 8th edition sees another book-load of stuff to add to games, much along the lines of last year’s volume, though I think 2018’s book is fairly interesting for the fact it includes the beta-Codex for Adepta Sororitas. But we’ll get to that! Chapter Approved 2018 is organised much like last year, with Open, Narrative and Matched Play each seeing a significant section, but the Appendix this year includes a lot of stuff, and takes up a major portion of the page space. In Open Play, we get the rules for looting vehicles for Orks, now that such things are not a part of their most recent Codex arrival. Narrative Play has the rules for Cities of Death, with a few pages of rules, four pages of Stratagems, and warzone rules for urban battlegrounds, followed by six missions. The Cities of Death stuff is really good, with a whole host of ideas for playing missions of a different kind. I think I first came across the idea in the Shield of Baal series, and I’ve loved the idea of a board crammed with terrain ever since – especially when it’s not just there for line-of-sight blocking, though the terrain rules could perhaps be a bit more immersive. 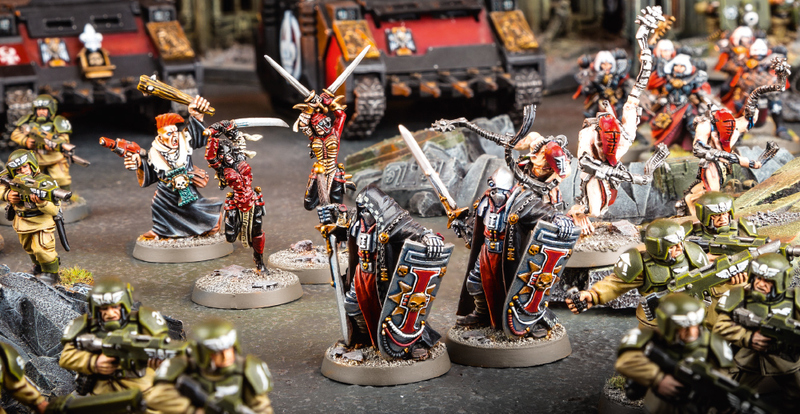 Also in Narrative Play are the rules for adding Battle Honours to your units if you so wish – apparently these have been ported-over from Kill Team, though I suspect Kill Team was the testing ground for these in the first place. It’s a nice idea to allow for some squad customization, and brings something of the RPG-like feel to the game that the original Rogue Trader had. I don’t mean to gloss over Open and Narrative Play in this manner, as there are some really interesting ideas in the book here for what promise to be really cool missions. I’ve already mentioned that one of my new year resolutions is to play more games, so I’m hoping that I can do so with these things, as well as more regular 40k matched point games. I’ll be sure to report back as and when I do, anyway! The Matched Play section then gives us twelve new missions – six Echoes of War, and six Maelstrom of War. There’s one such mission, Disruptive Signals, which includes the unique Stratagem for 1 CP that allows you to basically deny your opponent from achieving an Objective this battle round. It sounds quite powerful on first glance, and I think the potential is likely there, but more often than not I could imagine this being in use more as a defensive thing than a “gotcha!”-type moment. Interesting stuff, anyway! Finally, the Appendix gives us four hefty chunks of important book: revised terrain rules, the beta-Codex for Sisters, the formerly-pdf download Index for Renegade Knights, and all of the updated points values for the armies. These points updates include everything that has been changed – whether it was changed in Chapter Approved 2017, the Big FAQ, or newly-changed in 2018. So at least you won’t need to reference all of these different places to update your points values! I would assume that’s how they will do it from now on, so any points value changes from here on will be included in 2019’s book, but anything that doesn’t change between now and then will still be included because it has changed at some former point in time. Nice! The beta-Codex has everything we would expect from a normal book, it even has two pages of the lore and the usual ‘Eavy Metal showcase, which is cool! 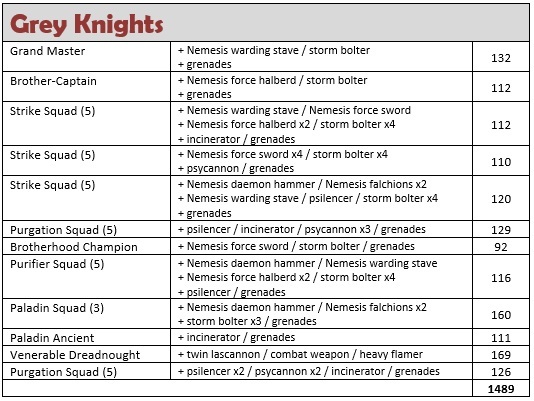 There are 22 datasheets, for all of the Sisters units as well as Ministorum Priests, Death Cult Assassins and the like; 14 Stratagems (including the usual ones such as extra relic stratagems); they get their own Chapter Tactics, called Order Convictions, and a table of Warlord Traits and Relics as to be expected. 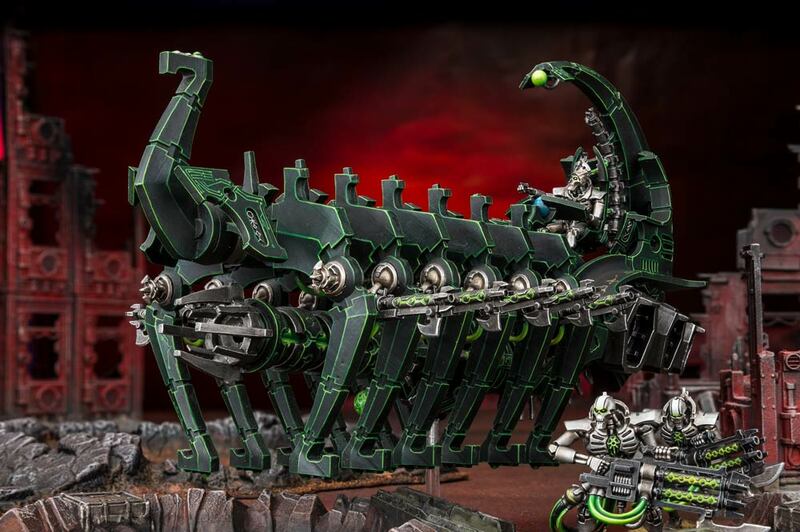 I’m not a Sisters player, so I can’t speak to the strengths or weaknesses of the army as presented here, but it is really cool to see the designers giving this much attention to them at last! I’ve previously written a blog (one of my favourites, actually) about the army, and how hard-done-by they have been, so it’s nice to have this kind of reversal. 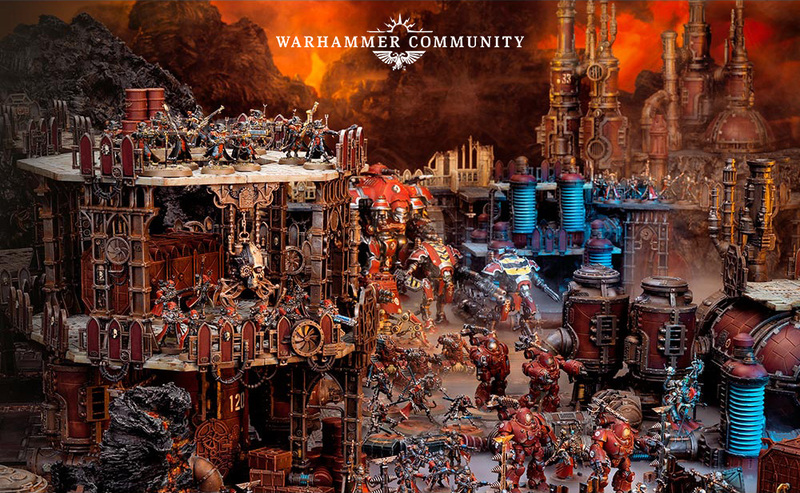 Of course, the Codex does only feature rules for the existing models, but I believe there will be entirely new units created for the Codex release when that eventually happens (sometime in October 2019, apparently), so it’ll be interesting to see if there are any synergies we’re not seeing, or if they have purposefully had to leave some things out. Current rumour mill points to the new units being HQs, though I would hope that they get something more in the way of unique troops choices. My reasoning for this is that the other two armies of the Inquisition have a similar flavouring. Deathwatch can take Kill Teams as troops, which include bikers, terminators and vanguard veterans as well as more generic marines. 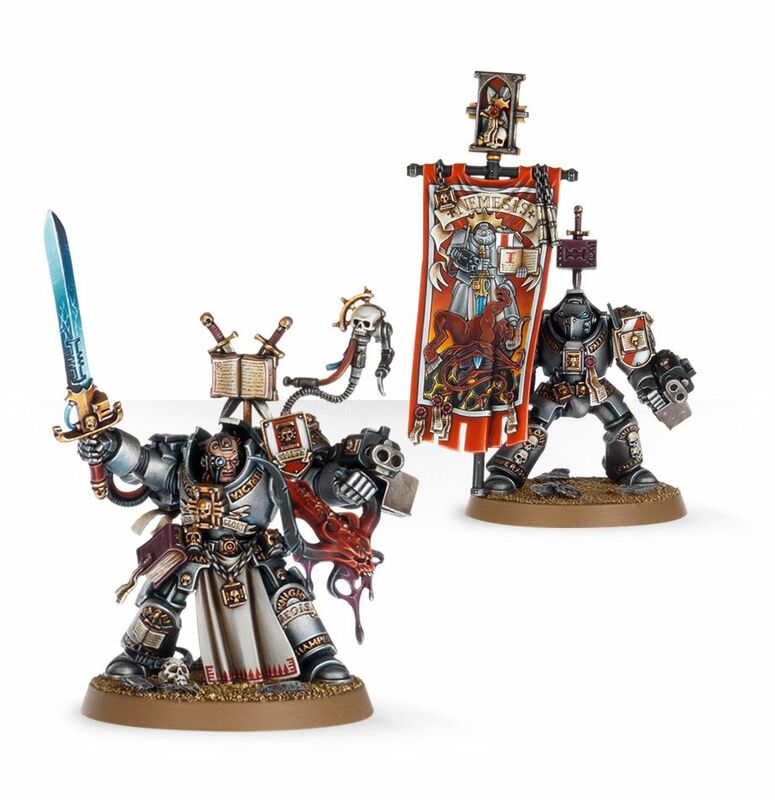 For the Grey Knights, terminators are classed as troops, and that’s that. 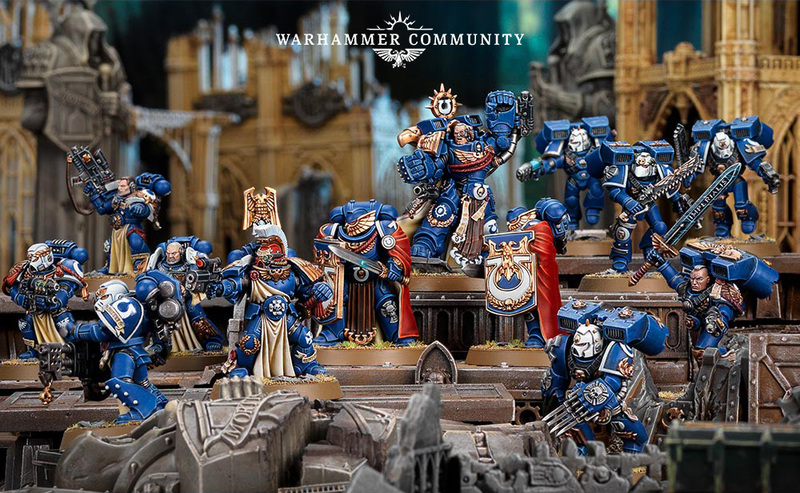 I wonder if the Codex might make Celestians, if not Dominions into troops, so that we have a troops choice all wielding flamers, or something thematic. Finally, let’s talk points updates! I’ve not had a proper chance to look through the book in relation to all of my armies, but I’ve been eagerly looking at some of those I’ve been talking about most recently on my blog, and I’m really surprised at how much some of them have dropped! To start off, let’s look at the Necrons! Back in September, I wrote a fairly in-depth blog that showed off a 1994-point list and the reasons for why each unit was included in the army, along with some thoughts on how I wanted the whole to work. In this brave new world of Chapter Approved, I’ve lost a total of 224 points off this list, as it now comes in at 1770 points precisely. Things like the Triarch Stalker and Annihilation Barge have seen some hefty reductions, and the amount of infantry I use means that I’ve lost a total of 50 points simply because the weapons have dropped slightly! I’ve not finalised my plans for the new force yet, but I’m thinking I may well bring along another Triarch Stalker for the Targeting Relay shenanigans, and then share the remaining points out among things like Tomb Blades or more troops. Alternatively, I could always include the Night Scythe in my list, as I do have it painted up and ready to be used!! 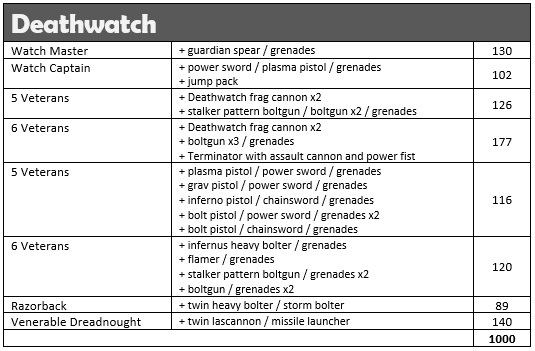 The Deathwatch were featured a bit more recently, with a list that tipped just a little over 1000-points. Well, Chapter Approved 2018 has taken almost 100 points off it, so that it now comes in at 944 points. This is mainly due to the 54-point-drop of the Venerable Dreadnought, which is a theme of my other recently-mentioned force, the Deathwing! These chaps were very awkwardly placed at 1580 points when I last looked at them, but the total cost of the army as I’ve built it to date now weighs in at 1426, with the Knights being a significant factor in this drop. 190 for a squad of five, rather than 258 points, is a real boon. The Venerable Dreadnought and the Grand Master both also have their contributions to make, but this does mean that I can now much more easily field the army in 1500-point games, rather than trying to make a decision on what I need to cut. Same story with the Deathwatch, really. I still need to look at the Tempestus Scions army, and the Skitarii force that I’ve been thinking about for a long time, but it looks like the former is mainly going to benefit from weapons point-reductions, while the latter sees more changes across the force as a whole. A job for the next few days, then. Interestingly, Dark Eldar don’t have any changes whatsoever to the main army, while I’ve already talked about the changes to my Genestealer Cult when the points changes had been leaked online. I want to think about my Tyranid army plans, as I’m not sure how I want to expand that just yet. As for my Tau thoughts, well I still need to decide if I even want to keep the army, let alone how I want to field it! But that’s probably a discussion for another day. Right now, I’m focusing more of my attention on the Imperium (and, increasingly, on Chaos) so I suspect there will be plenty more to come for the various factions here! I’m not abandoning my xenos, of course – the Great Reanimation will continue for a while yet! – but I want to have Imperium armies that I can actually play games with, rather than just odd collections of some Imperium models that are a bit orphaned among the mounds of plastic… So 2019 might well be the year I get round to that! Whether you’re celebrating in style, or just enjoying a pleasant Tuesday, I hope you’re all having a fabulous day. While it is Christmas Day for many, it’s also game day here at spalanz.com, and today I thought it would be a great time to take a look at one of the classics – and take the opportunity to finish a series of board game reviews that has been on hiatus for nearly three years! 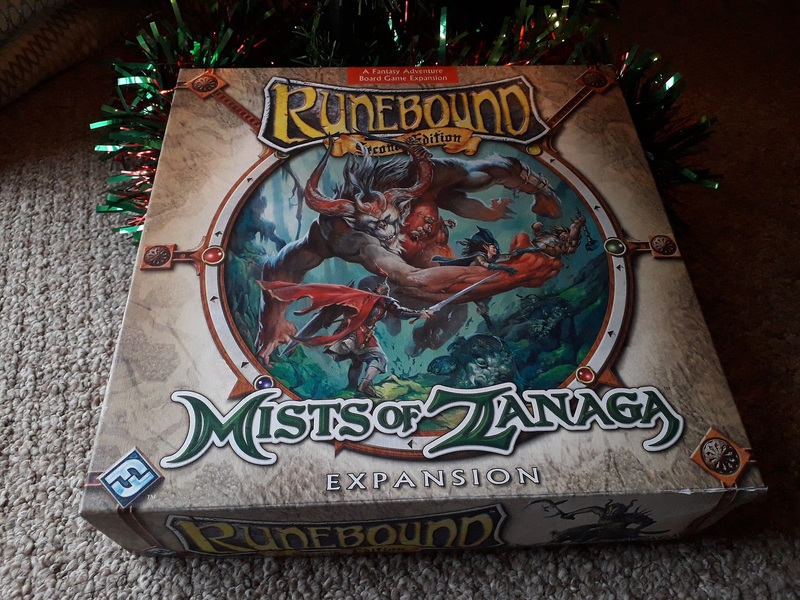 Let’s take a look at the fifth and final big-box expansion for Runebound: Mists of Zanaga. 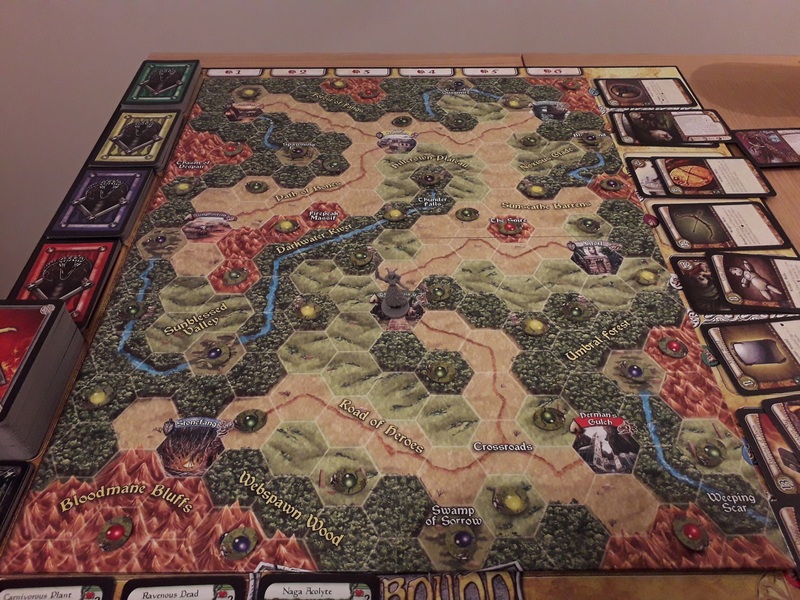 Mists of Zanaga is a jungle-themed expansion for the classic fantasy adventure game from Fantasy Flight, and was released all the way back in 2010. In the same theme as previous big-box expansions, such as its predecessor The Frozen Wastes, we are transported to a new realm within Mennara. The game’s storyline involves the survivors of the Dragon Wars sailing across the ocean and finding the mythical lost realm of Zanaga, populated by the jungle-dwelling makhim, and the singhara of the savannahs, as well as savage orcs and savage barbarians who live in the ruins of a lizardmen empire. As with all big-box expansions for Runebound, we get a new gaming board as well as new heroes, new adventure decks, new items to buy, and a couple of new mechanics. The expansion should be noted for having possibly the best ever design for the back of its adventure cards, but anyway! 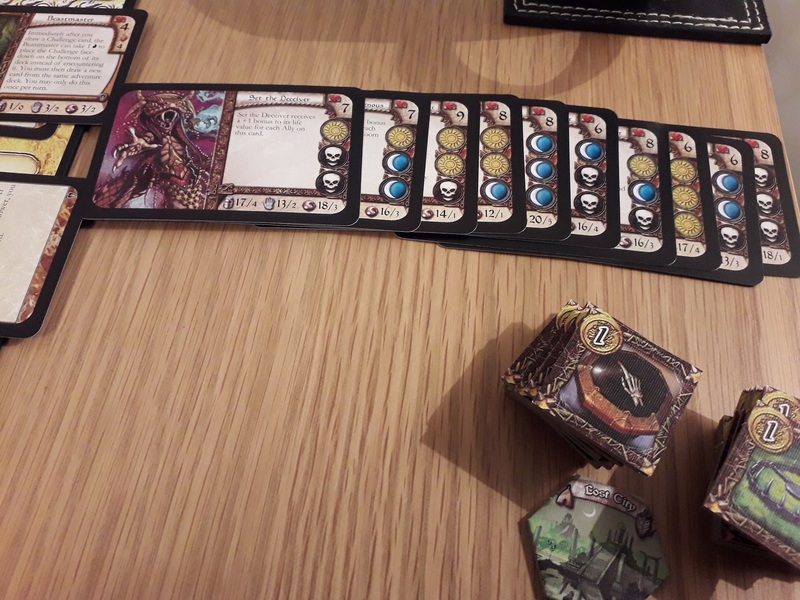 The new mechanics for this game involve the Rituals – these cards, like the adventure decks, are coloured green through to red. Whenever you draw an encounter, you add a Ritual token to the card – when defeated, the token is placed on a Ritual card with a corresponding icon. When these ritual cards are completed, they are used to determine which ancient god will be awoken to defeat Tarakhe. After the first three Ritual cards have determined the god you will face in the final showdown, that god’s card is flipped to its Omen side, and further completed Rituals will trigger the effects of these Omens until the players can confront the god himself. Moving around the board is pretty much the same as we have come to expect, and we also get survival gear as is common for the big-box expansions. Crucially, there is also a Lost City token that comes into play when certain Rituals are completed – you need to be on the Lost City space in order to confront the ancient deity. While the game is basically Runebound but with different characters and adventures, I find myself completely drawn in to the theme of these expansions, and I rarely find myself feeling like I’m having the same gameplay experience with each one. However, while Frozen Wastes feels cold, and Sands of Al-kalim feels hot, Mists of Zanaga doesn’t really have the same sort of environmental feel to it, as weird as that may be to say about a board game. The closest this one comes to having something global going on is the Roaming Monster track, which effectively replaces the Undefeated Monster track, re-implementing the idea in an interesting way. Each monster encounter card features a terrain symbol on the right-hand side. If you don’t manage to defeat the monster, it goes along the bottom of the board on the Roaming Monster track. In subsequent turns, if you end your movement in a hex that does not feature an encounter or a market, you must check if your terrain matches any of the Roaming Monsters; if it does, then you have to encounter that monster, if not then you draw a new card and add it to the track. It does add an element of danger to the game, in that it does get you thinking about how you’re going to move this turn in the same way that the cold mechanic in Frozen Wastes and day/night mechanic in Sands of Al-kalim makes you think like that. The new survival gear we get in this expansion allows you to re-draw encounters, escape encounters, or change the results of the movement dice in order to make this easier, however, so there is that. All in all, Mists of Zanaga is a solid expansion for the game. It feels somewhat like the least complex of the big-box expansions we have available, though at the same time the Ritual mechanic is perhaps the most intense of all the new things we have seen. I suppose it is this that sets the expansion apart from all the others, as it strives for an Aztec/Mesoamerican flavour to the storyline, which does come through quite well to my Euro-centric way of looking at things. There are some classic fantasy tropes for the jungle setting such as lizardmen and frogmen, and I think jungle-fantasy is not often done so that this expansion gets a definite feel of uniqueness to it. The mechanic of awakening primal gods has often felt a bit like Arkham Horror to me, probably due to the terminology used rather than anything else. The talk of Omens and Awakening Gods has the definite feel of one of the many games from the Lovecraftian stable of FFG, to my mind! Gameplay-wise, of course, the game is very definitely Runebound. With no further expansions for Runebound Third Edition since Unbreakable Bonds in July 2017, the future of Runebound itself is a bit shaky. I don’t really want to see it go away, but I feel to some extent like this type of game has had its day. 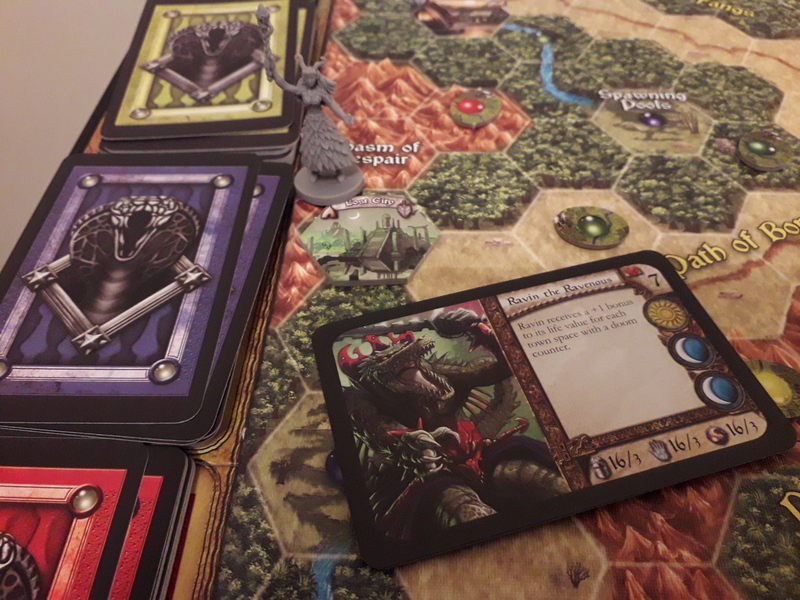 I talked about the culture of making boardgames more accessible in my Runewars blog earlier this month, and while I do kind of see a place for games like that, I’m not sure about those like Runebound. 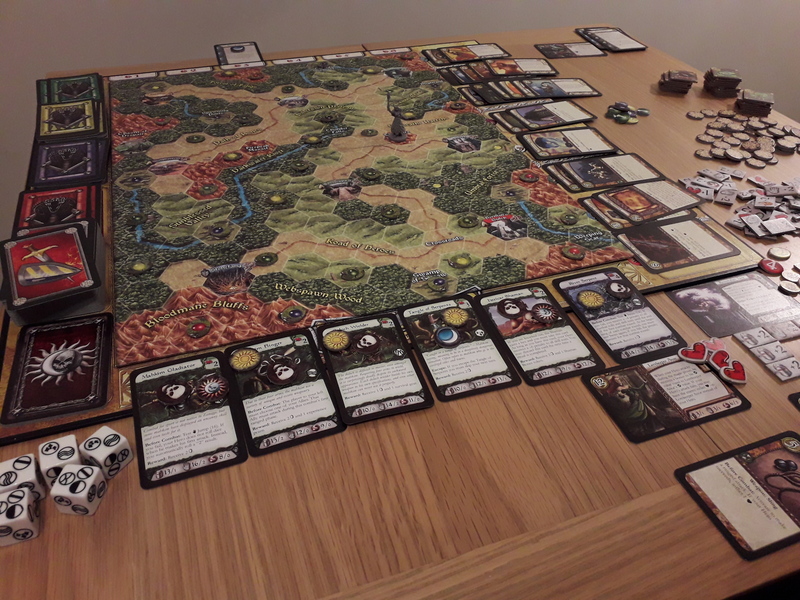 I suppose there are just more streamlined adventure boardgames out there now, and Runebound just feels a bit like it belongs where it belongs. People do like mass army games, but I think the adventure boardgame needs something more than Runebound can provide. The Witcher was a case in point, where the theme to some extent drives the game. I’m not entirely sure about Runebound, which has been continually lambasted for its vague, generic, bland fantasy setting. Personally, I love it, but that is more to do with my own history with the game. Looking objectively at it now, there is very little to help it stand out from the crowd. 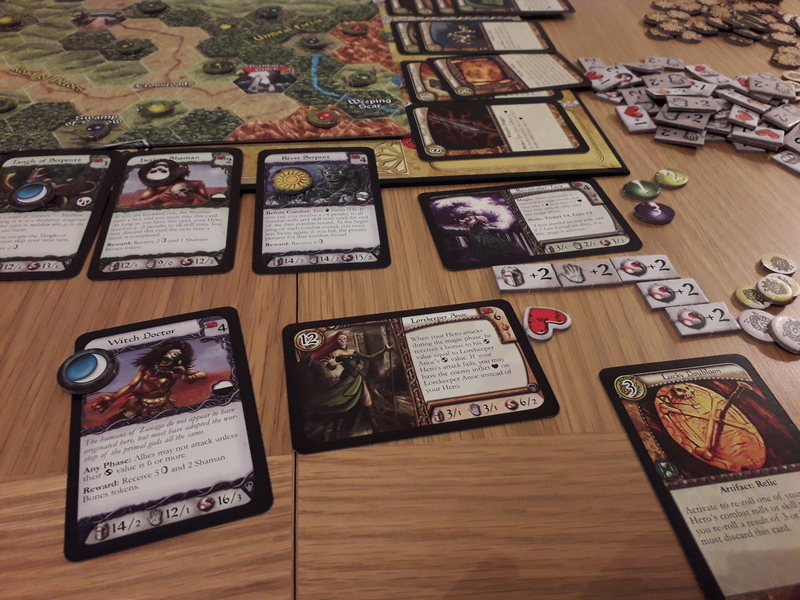 It definitely belongs to another time, and I think that could well be why FFG are choosing to look at new ways of implementing the Terrinoth setting, such as the RPG and the new card game, Heroes of Terrinoth.